Wow, I was not expecting that gorgeous PS4 Pro. Now that we have a release date for Kingdom Hearts III, which is confirmed from Square Enix at the PlayStation E3 2018 Press Conference, we also get a beautiful Limited Edition Kingdom Hearts III PS4 Pro and a quick peek of the new Pirates of the Caribbean world in the game. Square Enix revealed this photo of the Limited Edition PS4 Pro and it looks gorgeous! 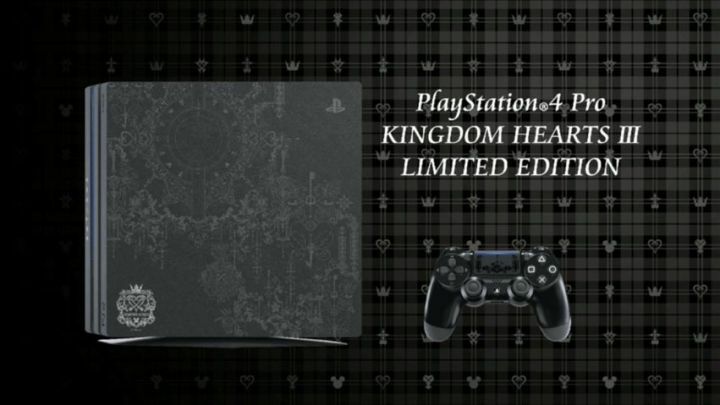 They also included details of a PS4-exclusive bundle and it comes with Kingdom Hearts 1.5, Kingdom Hearts 2.5, Kingdom Hearts 2.8: Final Chapter Prologue, and Kingdom Hearts III along with the PS4 Pro. They have not revealed any details of pricing or a release date for the bundle and PS4 Pro. Are you guys excited for Kingdom Hearts III? Kingdom Hearts III will release January 29th, 2019 for PS4 and Xbox One.